First of all, even though it is 3 Days old already, I wish you a Happy Happy New Year. I hope you had a good time welcoming the New Year. I had a really good time, even though I just stayed home by myself. I know this sounds strange but sometimes some alone time is just the thing you need. I made myself some yummy really unhealthy food, watched some TV and then watched the Fireworks at midnight that went off all around me. It was great. 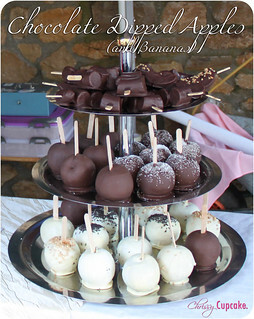 In my Recap Post, I told you about the Chocolate Dipped Apples and the Spiced Apple Punch and I thought I share the recipes with you. So we started off with about 60 Apples, that had to be washed and scrubbed a bit for the Dipped Apples and storebought Apple Juice (the Real one, not the Concentrate one). For the ApplePunch we heated up the Applejuice with Oranges and Lemon and in a separate Pot made a Spice mixture with Cinnamon, Anise and such to give it some really Christmas-sy Flavours. The Trick is, to cook the Spice mixture in a separate Pot, before adding it to the Apple juice that is spiked with the Oranges and Lemon. The Spices are really up to your own taste. Switch them, add or distract, until you like it. Preparation: Get a big Pot, big enough to hold about 1 1/2 Gallons. You can even use your Crockpot or Slowcooker and a small pot to cook the Spice Mixture in. 1. Get all your Spices ready. 2. Slice the Oranges and Lemon in nice midsize chunks. 3. In the small Pot add about 3 to 4 Cups of the Apple Juice. 4. 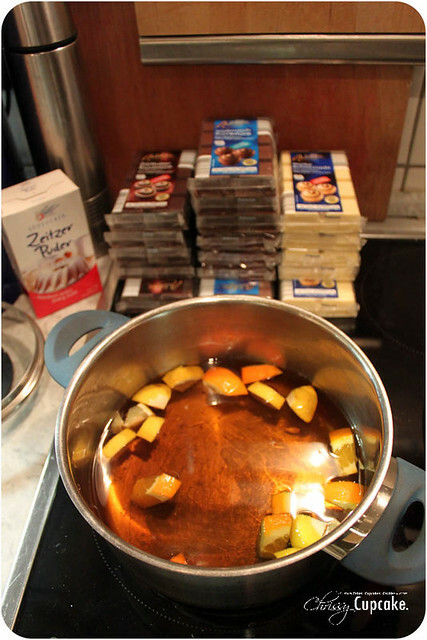 Pour the remaining Apple Juice in the big Pot, add the Lemon and Orange slices and slowly heat up over middle high heat. 5. 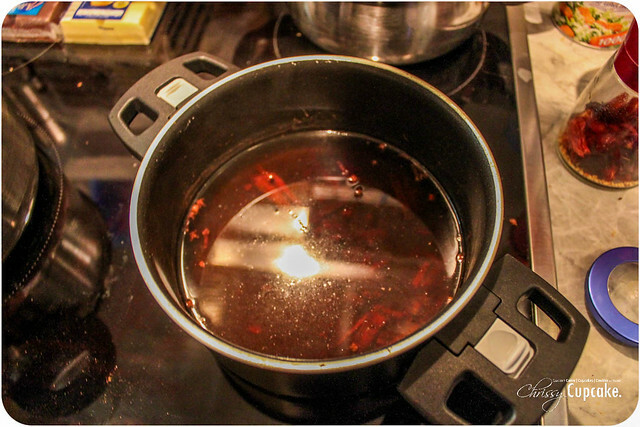 Add all the Spices to your own taste into the small pot and let simmer for about 10 to 15min. If you don’t particularly like one of the spices, just switch it out to your taste. 6. When it smells delicious enough, take a Strainer and add the Spice Mixture to the big Pot, sieving out the leftover spices. 7. Mix the whole thing and drink when it is nice and hot. For extra Goodness, add some whipped cream on top and for the Grownups, add a Shot of Rum, Whiskey or Cachaca. I made a cute little Chocolate Dipped Snowman. Sorry for the bad picture, it’s nose got a little smudged when I tried to adjust him… Oh well, he still looks adorable ^^. So my trick to making those is not melting the chocolate in the Microwave but actually doing it the old fashioned way in a double Boiler. I just use a Pot with a Metal Bowl on top that doesnt touch the water that is inside the pot. I find it much easier to melt the chocolate nicely without burning it. It may take longer but personally it just gives me the better results. In the picture below you can see my Pot with my Metal Bowl. 1. Wash the apples,scrab them, cut out any ugly parts and the bottom leaves and the stem of the apple. Dry them really well. 2. Stand the apples up and push the Popsickle Sticks all the way through the apple. There should be plenty of Stick still sticking out of the top to hold them nicely. 3. Melt your chocolate with your prefered Method. 4. Get a baking sheet out, line it with Parchment or Baking Paper. 5. Take your apples, dip them into the chocolate and swirl them around to make sure every side got enough chocolate, you can help with a Spoon. 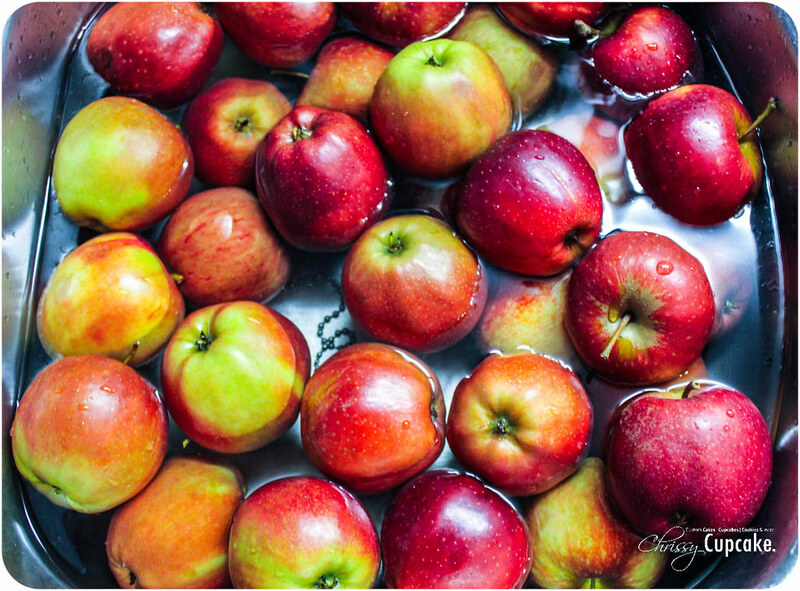 Tap the Apples with the sticks at the rim of the bowl to drip of the excess. 6. Put them on your baking sheet to dry. While they are still wet, add your Sprinkles or any other Decorations so they will stick to the Chocolate. 1. Repeat Step 1 from above. 2. Take the two apples, cut of the bottom of the Bottom Apple to make it stand evenly. Sit the second apple on top, use your wooden Dowel and Push through both of the apples so they sit tightly, a little bit of the Dowel has to stick out of the Top of the two Apples. Push the Half apple on top to give it a Hole so you know where to stick it later. 3. Take the Half apple back off. 4. 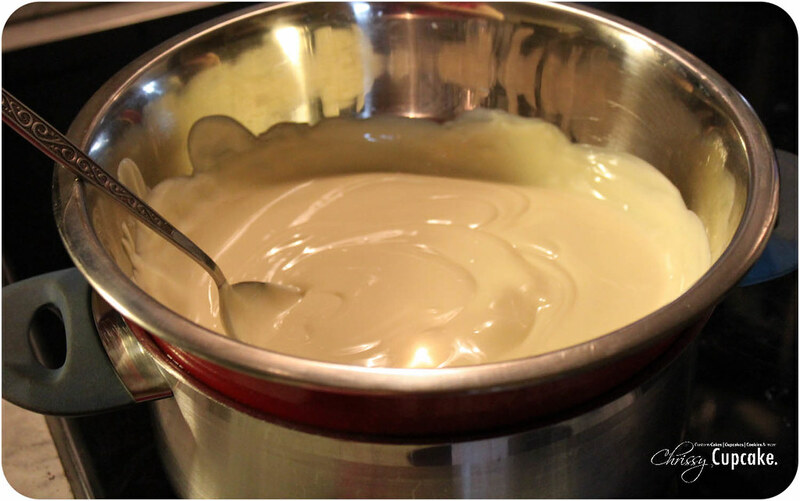 Melt your White Chocolate first. 5. Repeat Step 5 and Step 6 from above. Add the candies as Eyes, Nose and Buttoms for the Snowmans. 6. 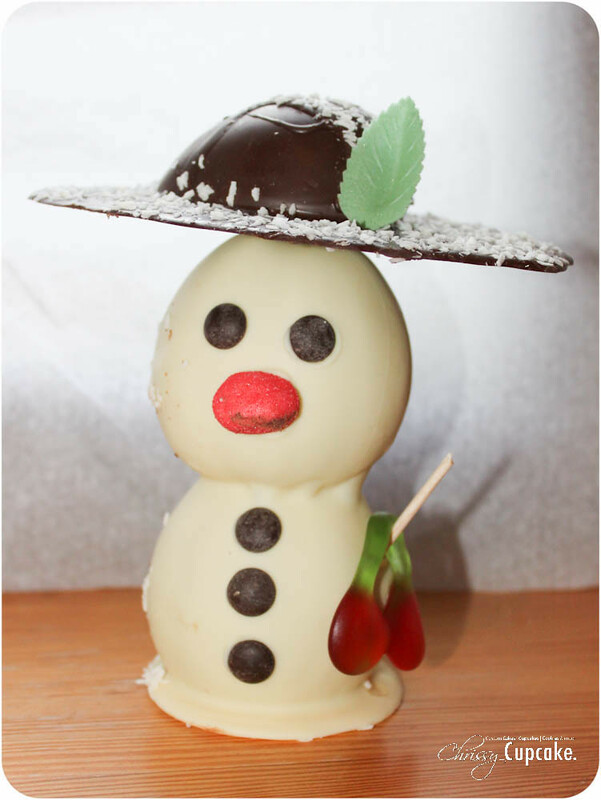 For the Hat of the Snowman, melt the Dark chocolate, dip the 1/2 Apple and put it on your baking sheet. With a Spoon add a puddle around Apple to make it look like a brim. Sprinkle Coconut Shavings on top, maybe add a little Fondant leave and let dry. 7. When the Hat is dried, put it on your Snowman and glue with a tiny amount of melted Chocolate. Those are fun to make with Kids. I hope you have a great 2013 and all your New Years Resolutions are gonna stay for a long time and help you to have a successful year. Lol don’t feel bad I was sick with bronchitis and tried having fun and I just so wanted to be in bed and watch the ball drop from there! By the way I’m hoping for a more successful year! And I love chocolate covered bananas and apples my son sent me a platter full from edible arrangements ! Best gift I got on my birthday! Lots of luck to you in the newyear ! Thank you so much for your kind words. I do hope my year is gonna be much better than last. If I listen to my horoscope, it should be an excellent year ^^. I hope your Bronchitis is all better now and you have a great 2013 and thank you for stopping by at my Blog. No problem! I’m hoping its my year as well and hoping for more success in my cupcake buisness! I’m still slowly recuperating but so much better now thank you!